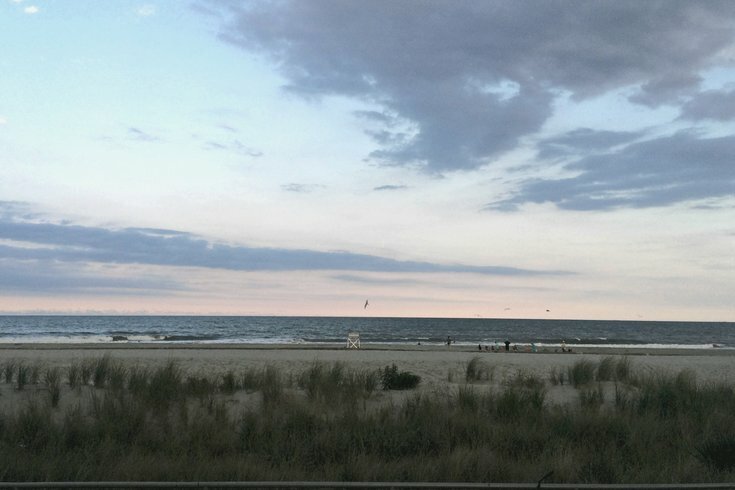 At a beach in Sea Isle City, New Jersey, a lifeguard stand and some people are seen in the distance on the sand. Sea Isle City, a Jersey Shore town with a dark and bizarre history, is going through changes. The water tower got a makeover. The Lobster Loft's big lobster on Fish Alley will soon be sold to the highest bidder. Old staples are giving way to new developments; most recently, it was announced that the beloved Springfield Inn might be serving its last beers this summer as a potential sale will give way to condos, shops, a new bar and a restaurant. But just as things change, they stay the same. You can still get a dozen doughnuts and your morning coffee at Nickelby's. You can still enjoy live music at Dead Dog Saloon — as long as you're not wearing a tank top. Nights still end with some ice cream from Marita's (or Scoops, if you're on the Townsends Inlet side). If you're visiting Sea Isle City this summer, here's what you need to know. Below is the latest Sea Isle City weather weather forecast, and here is the current surf report. Beach tags are required for all Sea Isle beaches from 9 a.m. to 5 p.m. from Memorial Day weekend through Labor Day for everyone 12 and older. Daily and weekly tags can be purchased at the beach. All tags, including seasonal tags, can be purchased at the Beach Tag office on the second floor of City Hall, 233 JFK Blvd. The office is open seven days a week from 9 a.m. to 4 p.m.; seasonal tags can only be purchased Monday through Friday. Seasonal tags also can be purchased digitally by downloading the Viply app. More information on beach tags can be found here. Lifeguards are on duty from 10 a.m. to 5 p.m. from Monday to Friday, and from 10 a.m. to 5:30 p.m. on Saturdays and Sundays. Lifeguards begin duty on Memorial Day weekend, and expand to more beach locations as the summer goes on. For a list of which streets will have lifeguards beginning on what days, click here. No dogs are allowed on the beach from May 1 to Sept. 30. Specific sections of the beach are designated for sailboats, surfing and paddleboards, volleyball, kayaking, rafting and fishing. A list of those beaches can be found here. All beaches north of 20th Street and south of 93rd street that do not have lifeguards and are to be used at your own risk. Swimming is only permitted at beaches with lifeguards. Finally, stay off the jetties and don't feed the seagulls. More information on beach rules and safety tips can be found here. All parking meters are in effect from May 15 to Labor Day. Street spots with meters go by a rate of 25 cents for 15 minutes. Seasonal parking permits are available for $200, and weekly permits are $30. Permits can be purchased at City Hall. There are plenty of free street spots available, depending on the time of day, time of the year and where you're parking. If you're looking to park hassle-free, you're probably best off going south of 60th street. More information on parking can be found here. The big hub of events is where the boardwalk meets JFK Blvd. The main stretch of boardwalk, as well as the green space and gazebo, often plays host to farmers markets, festivals, family-friendly events and even yoga. There's also the nearby band shell in Excursion Park, which features regular, free summer concerts. Sea Isle is known for its bar scene. My colleague and I Brian Hickey, also a Sea Isle regular, ranked the town's best bars a couple years ago. A full calendar of events can be found here and here.